Pakistani Students have a great chance to avail the Fully Funded scholarship this year. Because The Fulbright Masters and PhD Program funds graduate study in the United States for a Master’s or Ph.D. degree. If you are interested to get the scholarship then you must be fulfilling the eligibility criteria, then you must apply for Fulbright US scholarship 2020 because its last date of application form submission is May 15 2019. So you must apply before the last date because after the deadline application form will not be entertained. The United States Educational Foundation in Pakistan (USEFP) was established in 1950 by the governments of Pakistan and the United States. Fulbright US scholarship 2020 Funded by the United States Agency for International Development (USAID), these grants cover tuition, required textbooks, airfare, a living stipend, and health insurance. USEFP also assists with the visa process. Pakistani citizens, qualified and working in Pakistan, with strong academic histories in all disciplines except clinical medicine are welcome to apply. 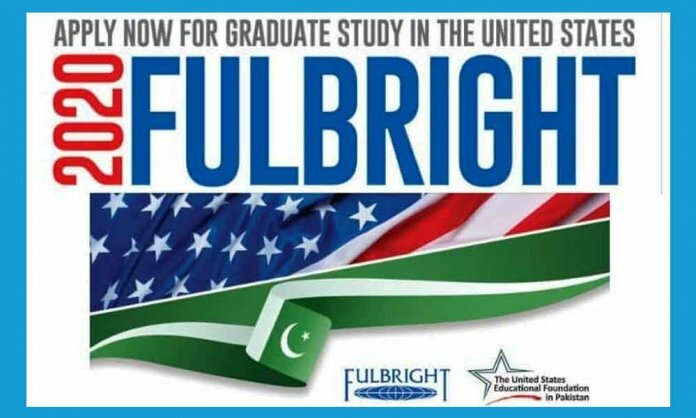 In addition to academic work, persons selected for Fulbright programs are expected to share information about Pakistani life and culture with their U.S. colleagues and with community groups in the U.S. On returning to Pakistan, Fulbright grantees are expected to share their U.S. experiences with colleagues and community groups in Pakistan. Successful candidates should be poised to assume leadership positions in their fields and must be committed to returning and serving Pakistan. What is included in a Fulbright award ? The grant funds tuition, textbooks, airfare, a living stipend, health insurance, visa fees, a computer and settling-in allowance. Fulbright awards enable grantees to live at the same standard as most American graduate students. How many scholarships will be awarded ? In 2020, USEFP hopes to award about 130 Fulbright scholarships. Other than study toward a degree, what is expected from successful applicants ? Your GRE score report and Scanned transcripts, including an explanation of the grading scale of the university issuing the degree should be uploaded. Please note that HEC-attested documents are preferable with the application but degree and transcripts attested by the issuing authority will be acceptable at the time of application. What is the deadline to apply ?